OKLAHOMA CITY (AP) – Oklahoma’s new Republican governor wants to use a projected budget surplus to give a $1,200 pay raise for public school teachers that would bring the state to tops in the region for pay and benefits for educators. The teacher pay raise would cost about $70 million annually and would be in addition to the average annual pay boost of $6,100 that teachers received last year . Stitt also unveiled his executive budget that calls for most state agencies to receive no boost in funding from current year’s levels. Some health and public safety agencies would see modest increases in spending. 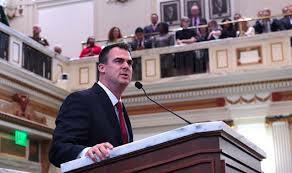 Stitt is also asking lawmakers to increase the size of the state’s savings account.